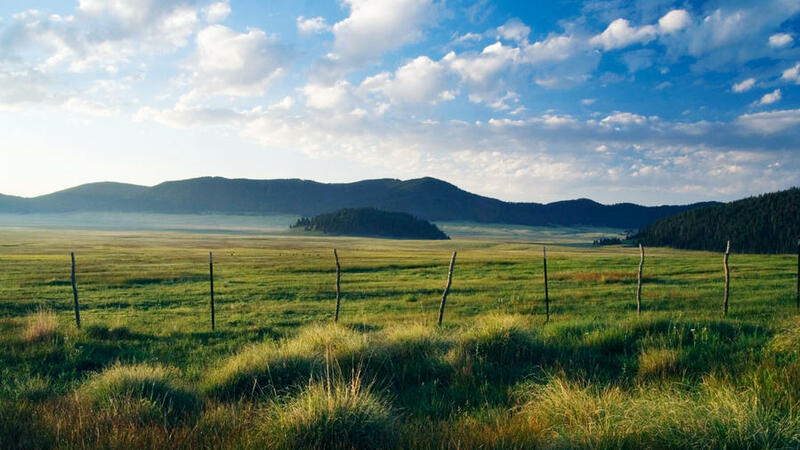 Redondo Campground: Just 15 minutes from the massive Valles Caldera (pictured), a recreation-packed preserve in the Jemez Mountains, Redondo is the closest spot to pitch a tent. Anchor among ponderosa pine for days of mountain biking, fishing, or climbing Redondo Peak. Bonus: Ranger events like Milky Way–gazing are held almost weekly at the preserve. $10; www.fs.fed.us/r3/sfe or 505/438-5300. Plan B: Jemez Falls Campground has an added luxury: A 1.5-mile hike leads to the bathwater-temp McCauley Warm Springs. $10; www.fs.fed.us/r3/sfe or 505/438-5300. Jack’s Creek Campground: This grassy spot is your jumping-off point for exploring the quarter-million-acre forested mountains of the Pecos Wilderness. Down the road, the Cave Creek Trail leads through stands of aspens and wildflower-filled meadows before reaching its namesake. The rushing stream snakes in and out of natural caves, some of which can be explored if you’ve got a flashlight. $10; www.fs.fed.us/r3/sfe or 505/438-5300. Plan B: Iron Gate Campground, a more-remote haven 10 miles away. $8; www.fs.fed.us/r3/sfe or 505/438-5300. Bonito Campground at Coconino National Forest: If an award existed for “campground with the most interesting landscape,” Bonito would be a shoo-in. Nearly a thousand years ago, lava oozed over this area from nearby Sunset Crater, creating a jagged black lava field with petrified rock bubbles and caves. During the same century, the Ancestral Puebloans were building 100-room dwellings from red sandstone in what is now the Wupatki National Monument, 18 miles away. $18; 928/527-3600. Plan B: Lockett Meadow Campground, 6 miles away on the other side of the highway. $12; coconinoforest.us or 928/527-3600. Maverick Campground: Sun-dappled Cimarron State Park has all the best of northern New Mexico: It’s 33,000 acres of crystalline creeks, abundant trout, shaded canyons, towering granite cliffs, and wildflowers galore. Take it all in from this creekside campground deep in the park, which comes with civilized touches like bathrooms and running water. $10; 575/377-6271. Plan B: The smaller, more-hidden Ponderosa Campground is across the road but lacks streamside sites. $10; nmparks.com or 575/377-6271. Cutthroat Campground at Apache-Sitgreaves National Forest: For a reprieve from the RV crowds at Big Lake, camp under the ponderosa pine and spruce at this small, tent-only campground a short walk from the beach. At 9,000 feet, the area offers a reprieve from Arizona’s summer heat. Try to score one of the sites with a lake view. Then rent a boat nearby—the lake is considered one of the best trout-fishing sites in the White Mountains. $12; 928/333-4372. Plan B: If all else fails, camp among the RVs on Big Lake’s shores at Rainbow Campground. www.fs.fed.us/r3/asnf or 928/333-4372; $16.